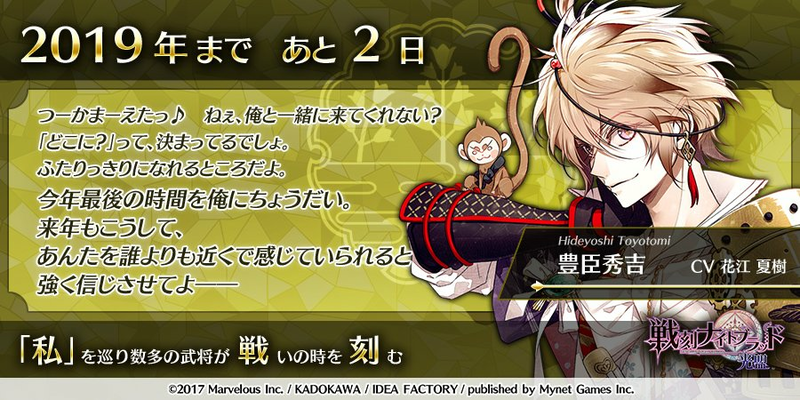 This entry was posted in Collaboration, Otome Games, Sengoku Night Blood and tagged Kadokawa, Marvelous!, Mobile, Otomate, SNB Hideyoshi. I think he’s assuming you guys are married already LOL look at him just grab you and then ask to be alone together with you ;)) ifyaknowwhatimean–. He has such a short message compared to everyone else but ahhh so fun as always! In my place already 31th December, so yeah this is the last day of this year, and once again thank you for this year, and hopefully you guys enjoy this New Year’s Eve, also have a good next year~! I wanted to catch up to the days and give you guys a proper countdown :’D Ehehe, honestly, Hideyoshi just needs to give the order and the entire castle would clear out for him, pfffff. Aw, thank you for the well wishes and I hope you have a great New Year’s Eve and welcome the New Year in style too! May 2019 be a great year for everyone /o/ and thank you as always for taking the time to visit this blog and leave comments!